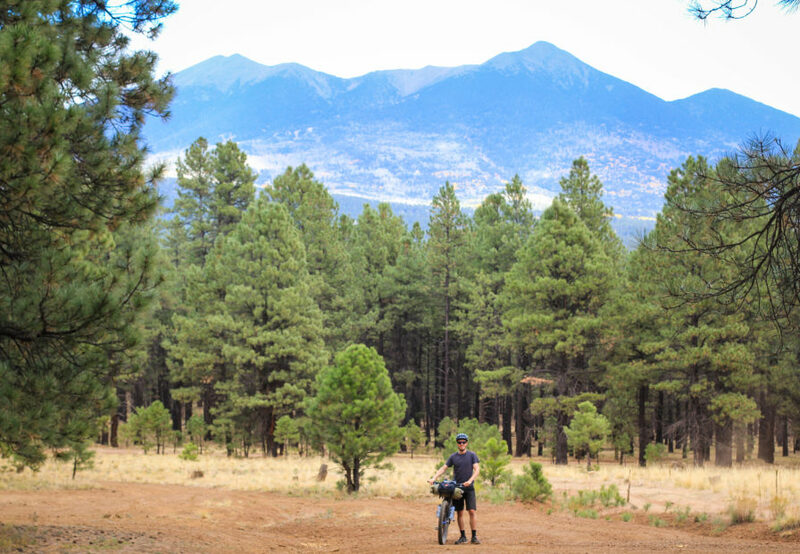 Get ready for an incredible bikepacking trip through the pine forests surrounding the spectacular city of Flagstaff, Arizona! Flagstaff, Arizona is a city in northern Arizona with a population of approximately 75,000 and situated at an elevation of 6,910 ft (2,106 m). The city itself is home to Northern Arizona University, which draws young, outdoor-minded individuals from all across the country, who come to study in the city and enjoy the outdoors whenever the opportunity presents itself. Cycling, hiking, hunting and disc golf are just a few of the popular outdoor activities in Flagstaff. 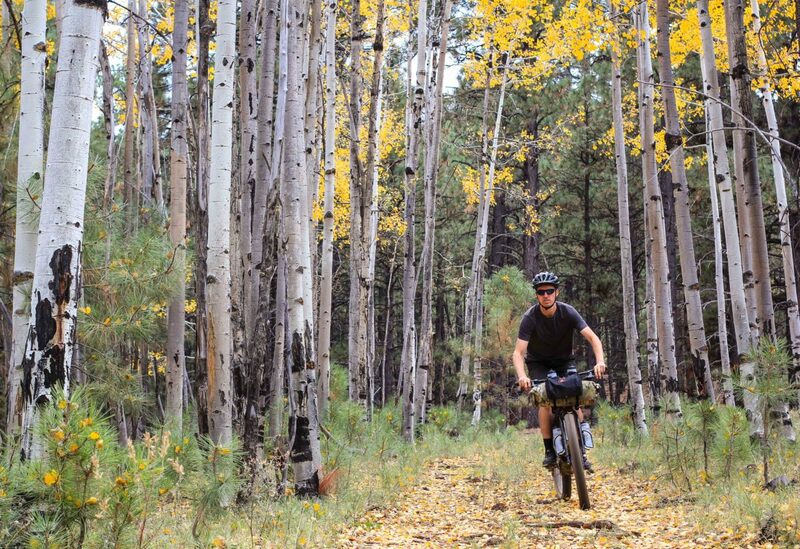 Outside the Flagstaff city limits lies a vast forest of ponderosa pines, countless dirt roads, and numerous single-track trails – all of which makes for some spectacular mountain bike riding. And one of the best ways to explore the forests of Flagstaff, Arizona is on the seat of a bicycle with a short, overnight bikepacking adventure. Watch the videos on this page and you will see me (Darren Alff, the Bicycle Touring Pro) participating in a short, 2-day, 1-night bike tour in the wilderness on the outskirts of Flagstaff and Williams, Arizona. Click here to download my free “Bikepacking in Flagstaff, Arizona” route map. Or click here for more information on bikepacking the Coconino Loop – another popular bikepacking route in Northern Arizona (which also happens to pass through Flagstaff, Arizona). Watch the bikepacking in Flagstaff, Arizona videos on this page and you will see that I parked my van in the forest, a short distance north-west of the Flagstaff city center. There are a number of locations around Flagstaff where you are allowed to camp for free in the National Forest. This is one of those locations… and I’ve marked the campsite on my Bikepacking in Flagstaff map as “Camping 1.” I’d recommend you leave your car in either the center of Flagstaff, or use this remote forest campsite as the base for your overnight bikepacking adventure. After you’ve found a safe place to park your vehicle, pack up your bicycle (don’t forget to bring lots of water) and hit the road! I recommend cycling north from Camping 1. You’ll pass Flagstaff’s famous lava river cave (which I recommend you stop and explore – it only takes about 1 hour). Then you’ll start cycling south-west toward the nearby city of Williams. Eating dinner in Williams is a good idea. Be sure to refill your water bottles in the city and then cycle just a short distance out of town and find a place to camp in the forest. I’ve marked the location where I spent the night on my bikepacking trip in Flagstaff, Arizona as “Camping 2” on my free “Bikepacking in Flagstaff, Arizona” route map. Feel free to camp in this location or in any of the other open National Forest areas. After a good night’s rest, pack up your campsite, load up your bicycle, and cycle the short distance back to Flagstaff, Arizona and your waiting vehicle. Day two is definitely shorter and easier than day 1, so take your time, enjoy yourself, and have fun! If you want to learn more about this bikepacking route or you have specific questions about bikepacking in Flagstaff, Arizona, please leave a comment below. I’m happy to help and will respond to your question or comment just as soon as I possibly can. Now, click here to learn more about bikepacking, what I pack on my bikepacking adventures, plus a whole lot more! Don’t forget to leave a comment and let me know what you though of my “Bikepacking in Flagstaff, Arizona” videos. This entry was posted in Arizona, Bicycle Touring Pro Articles, Bikepacking, Featured Articles, Featured How-To Articles, Main Articles, Main Featured Articles, North America, Uncategorized, Videos and tagged arizona, bikepacking, bikepacking arizona, bikepacking flagstaff, bikepacking flagstaff arizona, flagstaff, flagstaff arizona, flagstaff cycling, route map. how many miles was your total trip? Did you watch the two videos? It was about 80 miles. That is sick man, my wife and I do a lot of trails in the area, mostly hiking, but I think you have inspired me to get a mountain bike!